Orange outs three smartphones all destined for continental Europe. The devices you see pictured above are three of Orange's own brand handsets which will be landing in continental Europe in the first half of the year. Orange have conveniently summed up the features of each device below and they're interesting devices especially as we expect them all to have reasonable price tags! - The first ever 4G Orange Smartphone, with super-fast LTE connection speeds, 4.5" screen, 8MP camera, and running Android 4.1 Jelly Bean. - The first large format Orange smartphone, featuring 4.7" display and slim design at only 8.2mm thickness, 8MP camera and running Android 4.1 Jelly Bean. 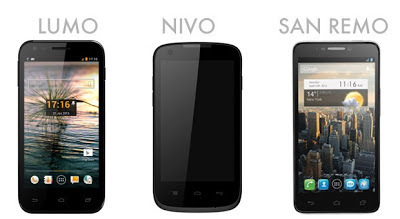 - Orange smartphone targeting youth and first smartphone markets featuring 4" display, 5MP camera, and running Android 4.1 Jelly Bean. It seems then that all of these will actually be quite solid devices. We don't know any more than what Orange's press release tells us at the moment, but it seems like Orange will have another set of good sellers on their hands here! The Lumo is the one which intrigues us the most purely because it does 4G on a budget, but we'll have to wait and see how much the devices cost when they launch! Expect there to be some hands on with these devices at MWC! Today, Orange is announcing the addition of three smartphones to its Orange own-brand device range, including its first 4G and large touchscreen smartphones. The phones are the latest additions to a portfolio which is becoming increasingly popular for Orange customers and combines a rich user experience and the best value for customers. The Orange own-brand device range has grown steadily in recent years to make up a significant proportion of overall Orange phone sales. Today, Orange is building on that success and aggressively developing its smartphone portfolio. With Orange smartphone sales growing by 62% and market share growing by 77% in 2012, Orange smartphones represent the fastest growing range of devices within our portfolio by market share growth. "All of our customers around the world, from Bordeaux to Bucharest, are hungry for sophisticated yet affordable mobile phones that allow them to reap the benefits of the mobile internet," said Yves Maitre, Senior Vice President of Mobile Multimedia and Devices, Orange. "The growth of our portfolio and, most importantly, the response from our customers, shows that our strategy is resonating in the highly competitive smartphone market that we're operating in today." In Spain, the Orange Monte Carlo was the top selling phone throughout 2012, and Orange's devices made the top 10 in the UK, France and Romania with the Orange Dallas and Orange Sydney. The success of these phones illustrates the fact that customers are seeking options in addition to the wide range of phones sold by Orange from traditional device manufacturers. "Orange's strategy of selling its own branded devices at affordable prices sets a very good benchmark for all industry players," said Francisco Jeronimo, Research Director, European Mobile Devices, IDC. "When consumers' needs are thoroughly understood, there is still room in the market to create value in all segments. These three new smartphones show Orange's strong commitment to innovation and will provide customers with a differentiated experience." The smartphones will be launching from H1 across a number of Orange markets including Romania, Slovakia and Spain (not all countries will carry all three devices). Pricing will be announced with local availability, but will be in line with previous Orange smartphone pricing and tariffs. All three devices will be on display at Mobile World Congress 2013, and can be seen at the Orange booth Hall 5 Stand 5H110.